Brandt Snedeker has already racked up two second place finishes and a third in just four tournaments on the 2013 PGA Tour circuit. And those runner-up finishes came in consecutive weeks leading up to the AT&T Pebble Beach Pro Am. Now, you can call him a winner this season. 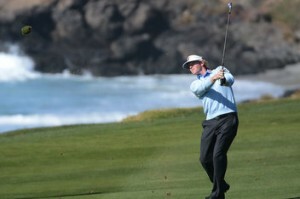 Snedeker won for the fifth time on the PGA Tour, and the first in 2013, with a two-shot win at Pebble Beach on Sunday. Snedeker fired a round of 65 on Sunday and won by two shots over Chris Kirk. Snedeker came into the week as the leader in the FedEx Cup points standings, with that lead only increasing after the victory. The win also moves him up to No.4 in the latest edition of the World Golf Rankings. Now, only Rory McIlroy, Tiger Woods, and Luke Donald are in front of the former Vanderbilt University standout. The first month and a half of the PGA tour season in 2013 has certainly belonged to Snedeker, and the win has been the icing on the cake. And like he said in an interview immediately following the victory, the win at Pebble Beach gives him a ton of confidence going into this season as he prepares for the Major Championships. The 2013 Masters is just two months away, beginning in the second weekend of April. The Masters in 2008 is where most of us learned Snedeker’s name, as he came close to winning his first Major championship. That first Major has still eluded him to this point, but it looks as if Snedeker is playing the best golf of his career, and if he keeps playing like this he will certainly be considered a favorite going into Augusta. In fact, Bovada Sportsbook has already updated their betting odds to win the Masters, which were released on Sunday night. Snedeker is behind on McIlroy, Woods, and Phil Mickelson on the betting line. Snedeker has been slated at 16/1 to win the 2013 Masters. Between now and then though, there will be plenty of tournaments to gear up, including finishing the West-Coast Swing before heading to the southeast for the Florida-Swing later this month and on into March. And on a personal note, for those of you who read our weekly tournament previews where we predict a winner, this is where a bit of bragging comes in because we selected Pebble Beach as the venue where Snedeker would get over the hump from the second place finishes and get into the winner’s circle. Had to add that in. This entry was posted in News and tagged 2013 master, brandt snedeker, pebble beach, rory mcilroy, tiger woods, world golf rankings on February 11, 2013 by Bryan.